Am I normal? I live in paradise with the beach at walking distance and my garden is filled with palm trees. A lot of people would pay good money to come here for just a week or two to escape their stressed filled lives. And I am at a point I just feel miserable and stuck on this rock. This phenomenon is called ISLAND FEVER and I feel my temperature is rising. There is just one cure: book a VACATION, preferably someplace far, far away. A break will make me long to go back to my little perfect island life. I am hungry for some normalcy and more than one shop or restaurant to choose from! Just to eat good (inexpensive) food will make me happy. And I would kill for a service with a smile. To get off a remote island is expensive but our budget allowed us to play for a week in Miami Baby! I need to confess that this is not my first visit to Miami. I have been several times but usually just for a weekend of shopping. Because everything in the Caribbean is overpriced, it is actually cheaper to book a weekend in Miami and do your shopping there. This time would be different though. I wasn’t there for the shopping but to explore this vivid city. Oh well, who am I kidding… whenever I see a store I get drawn in by some magical force. Tip: rent a car as most neighborhoods in Miami are too far apart to walk. Public transportation is not readily available and taxis can get expensive. 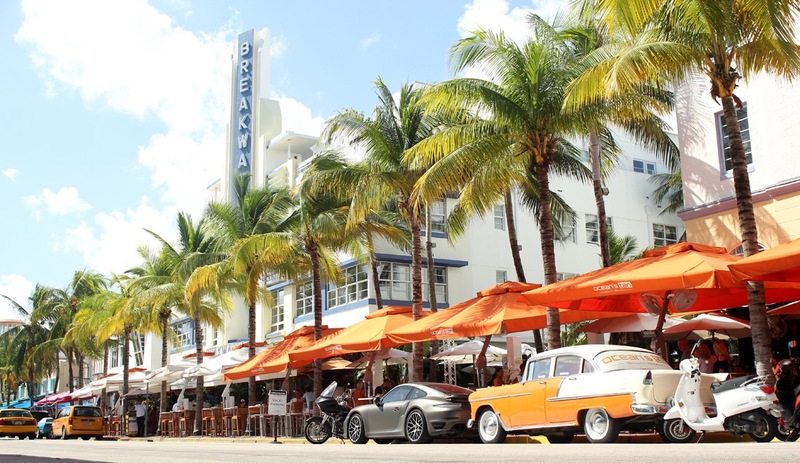 Lincoln Road in South Beach is an outdoor shopping mall, art deco style with plenty of restaurants and cafes. A lot of flagship stores but you can still find good deals. Great for people watching! Ok, I know! I live on an island and wanted to get away from all that… It’s just that I have this deep love for islands. And it is not the same as home. I wanted to see for myself what the Keys are all about. 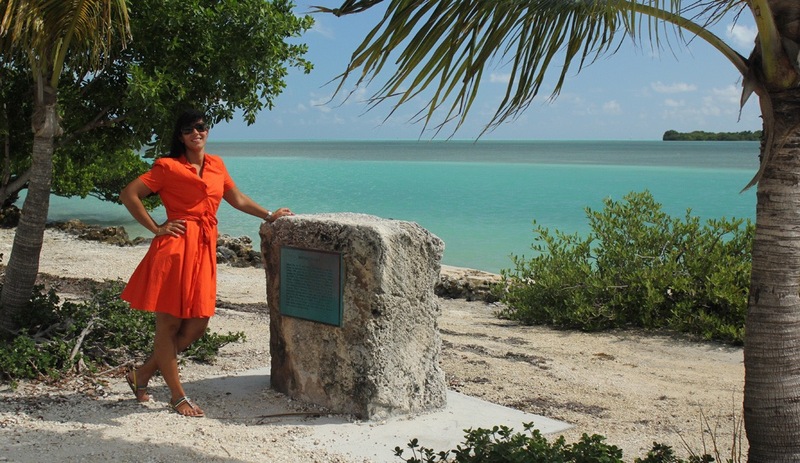 The drive alone is spectacular, with bridges leading from key to key surrounded by the beautiful turquoise water. It’s worth the 3.5 hour drive and if you have the time to spend a night here, I would most definitely recommend it. We wanted to visit some nature and encounter some wild life ;-). So we went to Bill Baggs Cape Florida State Park, which is only a 15 minute drive from downtown Miami. And we were very lucky!! 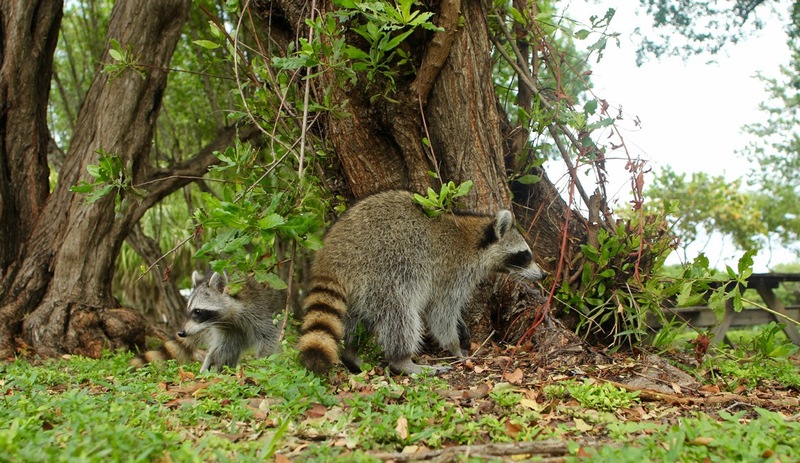 Racoons were waiting for us. My first encounter with these funny creatures. The park has a lot more to offer like sunbathe, swim and picnic on more than one mile of sandy Atlantic beachfront, which is featured on the list of “Top 10 Beaches in America”. Fun activities, but not for me. I don’t believe it can top the beaches we have in Tortola. I do recommend going up the historic Cape Florida lighthouse and get dizzy of the many stairs leading up to the gorgeous view of the beach at the top. I just feel so adventurous when driving along the long stretches of flat land and swamps filled with alligators. Keep your eyes open on the road as you can spot wild alligators. At tip to not go on the first tour you will find along the road as they are the most touristic ones. 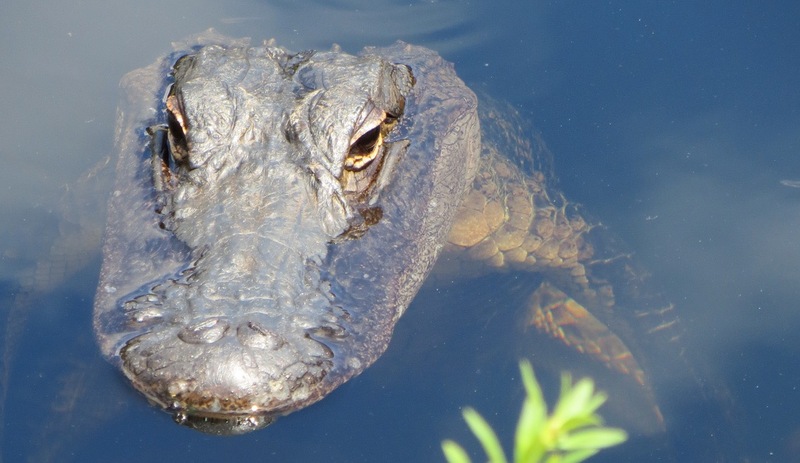 We chose to drive about a half an hour further and visit one of the few remaining Indian tribes in the USA, the Miccosukee, to see how they live and be up close and personal with their gator friends. And of course not to be missed when you are in the Everglades: gliding through the swamps in a hovercraft. Wow, what a nice feeling. I can do this every day!! So much fun. Our Miami friend told me to visit this place. 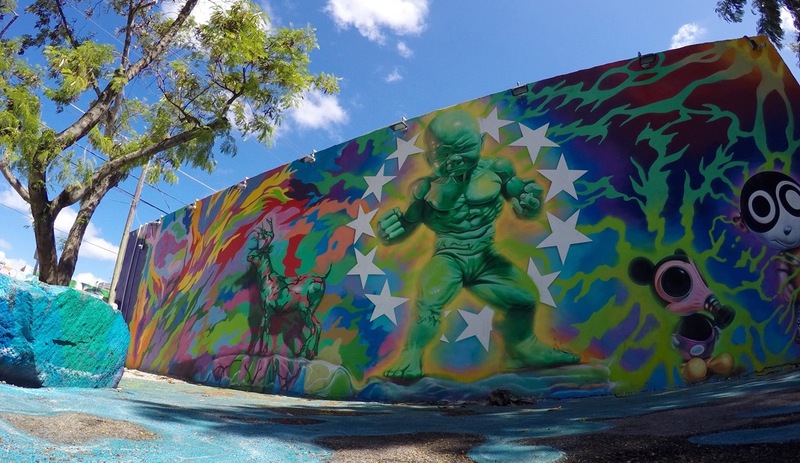 In her opinion Wynwood is a much hipper, cooler art neighborhood than the Design District. So I had to see for myself. And I am glad I did. This is a must do when visiting Miami and worth to spend a full afternoon walking around to check out all the murals and the shops. The whole neighborhood is filled with the most colorful street art, a lot of cool galleries and great little specialty restaurants. Visit the Wynwood Walls, try a super healthy smoothie at Jugo Fresh and eat at one of the hip restaurants with international fusion cuisine. The museum is open late on Thursday, also a recommendation by our friend. So we had a drink in the early evening and relaxed under the hanging gardens. 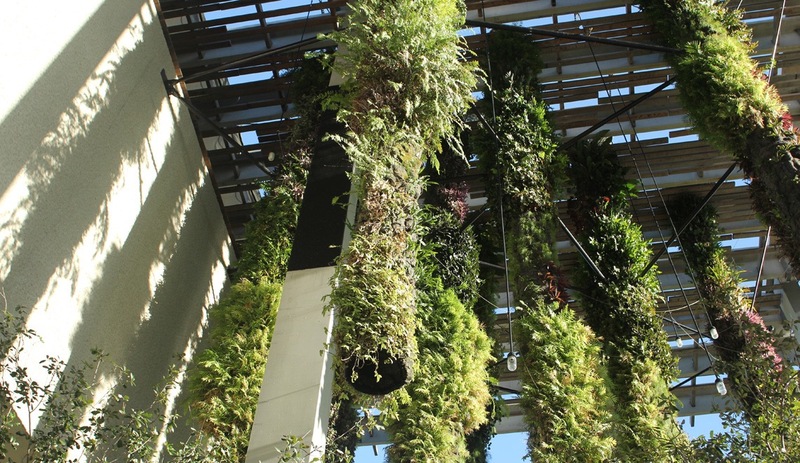 Yes, big massive hanging gardens! We took a stroll through the museum park. The museum has an open layout and features modern art from all over the world. At nighttime, the bridge in front of the museum lights up beautifully. South Beach is known as world renowned partying hotspot. I don’t really go to clubs anymore as I need a good night’s rest to have a fun filled active day the next day (I am getting older). 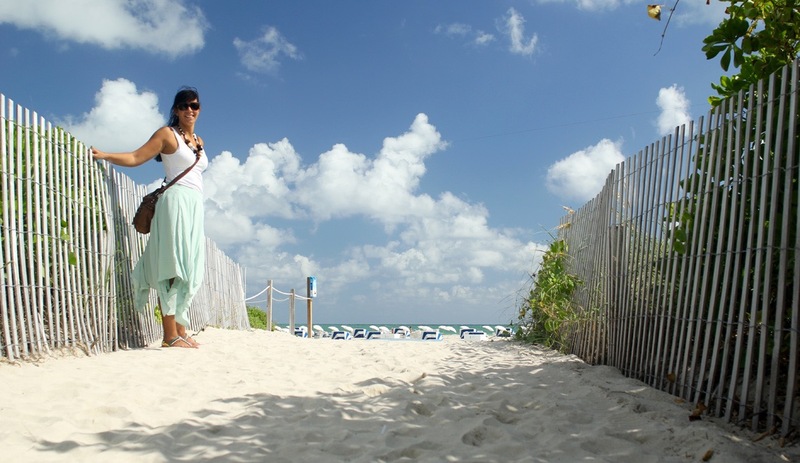 South Beach has much more to offer so you can have a full day during the daytime. I recommend just parking your car and start walking (or rent a city bike). Just make sure you avoid the sun in the mid-day as it can get extremely hot. Begin with a beach walk on the long wide stretched white sandy beach and the clear blue waters. Then, hop over to Ocean Drive. I love strolling down Ocean Drive and enjoy the fun, colorful and iconic Art Deco buildings ,which remind me of the old tv series I watched. 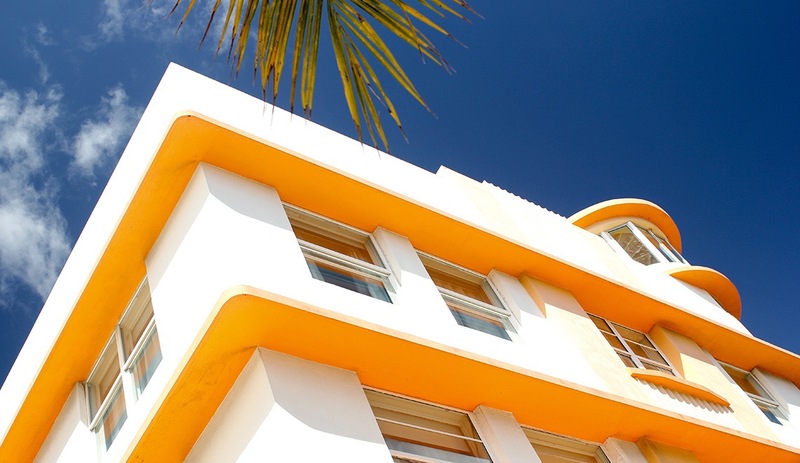 These art deco buildings can be found all over South Beach so make sure you explore the roads behind Ocean Drive such as Collins Avenue, Washington Avenue and the Latin influenced Española Way. Keep walking until you reach the famous pedestrian street called Lincoln Road. Take a seat at one of the many terraces for some of the best people watching in Miami. You can see the weirdest, best dressed, famous and most unique persons passing by your table. I wouldn’t recommend the restaurants in this touristic area as they are overpriced and the service isn’t great.